On January 21-22, 2015 UMASH participated in the Minnesota Pork Congress, held at the Minneapolis Convention Center, Minneapolis, MN. This conference was for pork producers, pork related agribusinesses, and others with an interest in the pork industry in Minnesota. It was sponsored by the Minnesota Pork Board and the Minnesota Pork Producers Association. UMASH exhibiting staff included Ruth Rasmussen, Carol Peterson, Alex Boland, Jeff Bender, Bruce Alexander, Peter Davies, Karen Lopez, and Darby Murphy. 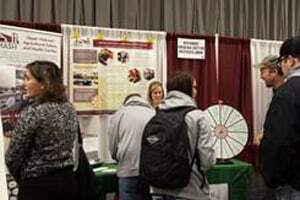 Many conference attendees were interested in answering our informal poll questions and taking a turn at spinning the prize wheel. For their efforts, participants were rewarded with a sturdy UMASH magnetized clip. Our booth featured the new needlestick prevention video and flash drives of the video were distributed to interested persons. It was a positive experience for both UMASH and conference attendees.